Are you just getting started with WordPress? Then you’ve come to the right place! 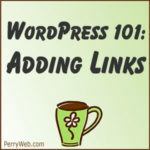 Our WordPress 101 Series is written with you in mind. These WordPress lessons take you step-by-step through some of the basics to get you going on your WordPress website or blog. Be sure to sign up for our newsletter to get a free WordPress Tips & Update Guide. From your page or post editor select the text that you want to link. Then click on the add/insert link control in the editor. Type the URL in the box. If you want to link to one of your own pages or posts, type some text in the box and WordPress will come up with a list of search results. Just click on the one you want. Once the link is in place, click the blue Apply control to insert the link. For more choices, like the ability to open the link in a new page, click on the gear icon. To change or delete a link you’ve already added, select the linked text and click on the Insert/Edit Link control. Click on the pencil icon to edit the link or the “x” icon to delete it. Another way to delete an existing link is to select the linked text and then click on the Remove Link control. Previous Post: WordPress 4.5 is Available!